Aston Martin has restyled the Toyota iQ's front end for the Cygnet, shown. 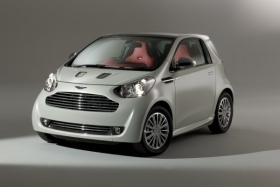 MUNICH -- Aston Martin has released official pictures of its Cygnet concept for a microcar based on the Toyota iQ. The British sports car maker said the Cygnet is designed to be a new luxury commuter concept car. "Work on the concept will continue into 2010 when it is hoped that it will become a production reality initially available to Aston Martin customers in the UK and Europe," the company said in a statement. The Cygnet could be offered to current Aston Martin owners as a second or third car. It has a front end with Aston Martin's styling cues and shares its platform with the iQ.